A reader of debates taking place in the U.S. Congress might justly conclude that U.S. sanctions have had a significant effect on the performance of the Cuban economy. Opponents of sanctions argue that sanctions have impoverished the island and therefore caused innocent Cubans to suffer. Supporters of sanctions argue that sanctions have kept valuable resources from Fidel Castro, rendering him unable to build his military and extend his security forces and domestic control. Both sides in the debate assume that sanctions prevent wealth from entering the sanctioned economy. The argument is only about who feels the brunt of the impact: the dictator or the people. But what if the sanctions actually have negligible impact on Cuba’s domestic economic performance? In fact, a detailed analysis of the Cuban economy during the 1990s provides compelling evidence that sanctions may not have the economic impact usually assumed. Instead, it is Castro’s internal policies—the lack of freedoms, property rights, and the rule of law; the use of repression, fear, and other totalitarian tools to maintain the regime in power—that account for Cuba’s poor economic performance. Let me quickly clarify what I am not arguing. I am not arguing that Castro’s actions are responsible for the current impoverishment of Cuba because his repressions caused the United States to sanction Cuba. Those who put this argument forward see sanctions policy as a response to dictatorship, arguing that sanctions seek (successfully or unsuccessfully) to sow the seeds of discontent and insurrection by impoverishing the island. Such an analysis would shift responsibility, moral or political, for Cuba’s impoverishment to Castro’s regime; yet, ultimately, it too assumes that the direct cause of Cuba’s poor economic performance is an external policy—the economic sanctions of the United States, the world’s largest economy. I argue the opposite. Empirical evidence demonstrates that the choices and actions of Fidel Castro have contributed to the island’s impoverishment, including its failure to attract foreign direct investment, to a far greater extent than any external market event, including U.S. sanctions. This evidence closely tracks the predictions of a Public Choice model of the economic incentives facing the totalitarian dictator. To examine the impact of internal versus external events on Cuban economic performance, I examined the Cuban economy beginning in the early 1990s, to coincide with the time when Cuba re-entered the world economy absent significant dependency on the Soviet Union. The data from that analysis indicates that the impact of U.S. policies is dwarfed by the impact of Cuba’s domestic policies. By the early 1990s, Cuba had been ruled by Fidel Castro for some 33 years. It is perhaps worth recalling that when he came to power in 1959, Cuba had a per capita income among the highest in Latin America (U.N. Monthly Bulletin of Statistics 1961). However, shortly after the revolution that overthrew Batista in 1959, Castro nationalized nearly all property. From the first Agrarian Reform Law of May 1959 and the second Agrarian Reform Law of October 1963, his government actively worked to liquidate the capitalist system, eliminating Cuba’s market- oriented institutions and supplanting them with institutions that support a centrally planned economy. The resulting Marxist-Leninist command economy ran production into the ground. Cuba survived as the Soviet Union’s largest aid-receiving state, absorbing an annual Soviet subsidy of approximately $5 billion. 2 In the early 1990s, upon the collapse of the Soviet Union, subsidies ended. The Cuban economy entered a period of crisis, when for the first time it faced market pressures. From 1990 to 1993, the country’s imports and exports dropped precipitously as the Soviet subsidies ended. Cuba’s fixed capital and inventories began to degrade and diminish. Merchandise imports fell by 75 percent from 1989 to 1993 (Pérez-López 1996). According to some estimates, up to 80 percent of the factories were unable to operate because of lack of fuel, machinery, raw materials, and spare parts (Pérez- López 1996). As the Cuban government maintained fixed prices and continued its priority of keeping state-run enterprises in business, the budget deficit increased from 9.4 percent of GDP in 1990 to 30.4 percent in 1993 (Hernández-Catá 2000). Since prices were fixed, real balances increased, which further exacerbated shortages and depleted inventories. In the small black market for some agricultural products, inflation increased from 2 percent in 1990 to more than 200 percent in 1993 (Hernández-Catá 2000). These actions, with associated expectations of continued reform, caused the Cuban economy to level off and begin to grow toward the end of this period. Foreign investment rose. The fiscal deficit dropped, reaching 2.5 percent in 1996. With monetary tightening, inflation returned to lower levels and national savings increased. • Important sectors of the Cuban economy are off limits to foreign investors. • The Cuban government can terminate a joint venture at will, claiming as national property any capital and assets in Cuba. With no guarantee that the Cuban government will not seize everything, and a few cases of this type of seizure actually happening, the disincentive to invest in Cuba is apparent (Travieso-Díaz and Ferraté). In addition, Cuba’s government wanted the benefits of liberalizing the economy without paying the cost of losing political control. When the middle class began to grow and civil society started to develop, Castro responded by retreating from some of the reforms and increasing repression. In early 1996, he cracked down on Concilio Cubano, an umbrella group, created in November 1995, that consisted of 108 dissident factions. They had petitioned the government to meet in Havana from February 24 to February 27, 1996: the meeting never took place and many leaders were subsequently jailed. In the late 1990s, economic growth began to slow, and foreign investment in Cuba fell. But what really explains the decline? The quality of the Cuban workforce did not diminish. Cuban workers remained competitive among the economies against which Cuba competed for foreign investment. Infrastructure was not deteriorating at an appreciably greater rate. The possibility of some demand shock has been investigated and dismissed by Hernández-Catá (2000). Nor does Cuba’s poverty per se help explain the shift: for, while the island’s economic performance remained significantly below its 1989 levels (Hernández-Catá, 2000), by the late 1990s, it had nonetheless improved dramatically from its earlier lows, an improvement that might have tended to boost investors’ expectations that it would continue to grow. Of course, the literature contains ample explanation of why foreigners might have invested in Cuba in the mid-1990s but then reduced their rate of investment and even pulled out of Cuba in the late 1990s. The slide in Cuba’s economic performance had leveled off in 1993, likely due to the Cuban government’s economic reforms and its concerted effort to attract foreign investment. Thus began a virtuous cycle, however brief, where investment led to economic growth, which inspired additional investment based upon expectations of additional economic growth. In reality, however, the government was not prepared to give up monopoly power over the sources of wealth on the island. This gradually became more evident as economic reforms were slowed or reversed, and political repression grew. Thus, in spite of the early rhetoric, the practical value of the reforms began to diminish, the pace of structural reforms began to slow, and by 1995 fears of policies being reversed became apparent. Indeed, the unwillingness of Cuban authorities (either in Law-decree No. 50 or in Law No. 77) to permit foreign investors to acquire title to the properties in which they invest, and statements by Cuban officials that reinforced Cuba’s commitment to maintain its socialist economic and political structure, negated some of the positive climate created by the investment protection policies (Pérez-López 1996). 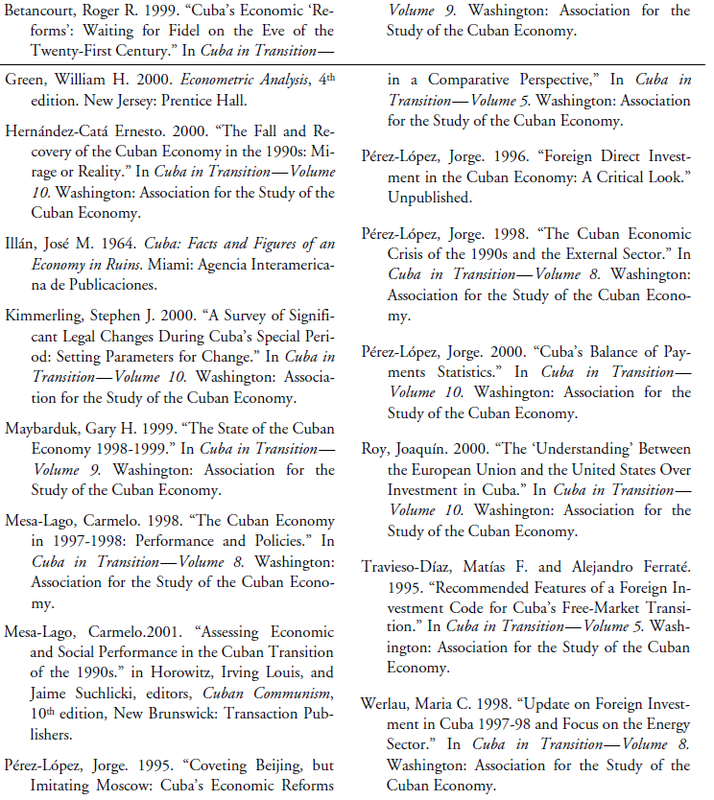 So, sufficient research and literature exists to conclude that, during the 1990s, Cuba’s internal policies were sufficient to both initially attract and then deter foreign direct investment. However, this summary history begs the question regarding U.S. sanctions. If the external policies of the United States towards Cuba caused the economic downturn, then internal political decisions would not be the primary perpetrator. To answer that question, we need to evaluate the impact of U.S. sanctions on the Cuban economy vis-àvis the impact of Cuba’s domestic policies on its economy. Using an event study, I have compared the performance of the Cuban foreign investment portfolio to a general market portfolio over the period of foreign direct investment in Cuba during the period 1994-2000 (the period in which the Soviet subsidy ended and the Cuban government could have been expected to seek foreign investment to supplant the lost income). To assess the impact of external and internal policy events, I looked at significant policy changes that could reasonably be expected to alter Cuban economic performance and the risks associated with foreign investment in Cuba. This included a close examination of international press coverage of internal and external events, reporting that would have been widely available to foreign investors and could reasonably be expected to inform their decision making. If external policies such as sanctions have an important or decisive impact on the Cuban economy, then events related to changes or anticipated changes in such policies should be reflected in significant changes in the Cuba portfolio relative to the benchmark, general market portfolio. At the same time, events related to Cuban domestic policies should have relatively little impact on the Cuban stock portfolio when compared to the general portfolio. In contrast, if Cuban domestic policies are decisive, then we might expect to see that changes or anticipated changes in Cuban policy change the Cuba portfolio relative to the world benchmark, and U.S. sanctions policies have relatively little impact. To overcome these difficulties in using Cuba’s internally- generated data, I used the stock price of companies outside of Cuba that made investments in Cuba. This approach provides two specific advantages. • First, this study is concerned with the impact of foreign direct investment in Cuba. Analyzing the micro-level data on companies that made such investments gets directly at the relevant issues. • Second, the indicator metrics, daily stock prices, are determined by a well functioning global capital market, specifically the NASDAQ, and prices are not subject to government manipulation. The figure may be most revealing when looking at the two most important events: Cuba’s Law on Foreign Investment of September 1995, and the U.S. Helms-Burton Law of March 1996. Cuba’s Law on Foreign Investment is arguably the most important piece of domestic legislation passed in Cuba during the 1990s. This law sought to entice foreign investment into the Cuban economy, promising to allow free-trade zones, permitting limited foreign business and property ownership, and promising administrative changes that would streamline and speed government approval processes. The figure highlights these two events on the timeline. It can be seen that the Helms-Burton Act, the single largest U.S. policy change during the observed period, did not significantly impact the Cuban foreign investment market, especially when compared to the magnitude of the change from the Cuban Law on Foreign Investment. Indeed, March 1996, or the months leading up to or following it, does not even appear in the list of six significant economic periods discovered in our benchmark comparison. The period around September 1994 is one of marked economic improvement, the first after the end of Soviet subsidies, followed Cuba’s introduction of legal “farmer’s markets”—farmers were allowed to sell their surplus crops to Cuban citizens willing to pay, and for any price they could obtain. Similar types of market reforms instituted in the People’s Republic of China in the 1980s led to significant increases in productivity and improvement in the economy. Perhaps, in the autumn of 1994, investors expected Cuba to follow China’s model. Whatever the case, a review of world and U.S. policy events during or leading up to September 1994 finds no significant external occurrences that might have caused Cuba’s upturn. During this period, in which the Cuba portfolio under- performed the world portfolio, a close review of the international press finds no external events related to Cuba. In contrast, on May 28, 1995, the Cuban government shows signs of retreating from its newly implemented, relatively open investment policies when, in violation of what should have been legally binding contracts, it unexpectedly expelled the Spanish managers of four joint-ventured Cuban hotels. In a country such as Cuba, where the government is subject to little or no oversight—no checks and balances—what matters to foreign investors may be how investors are actually treated rather than what the laws say.13 Although the world seemed to react with enthusiasm to domestic statements designed to attract foreign investment, this first public act of abrogating an otherwise enforceable agreement probably sent shivers down the spines of current and would-be investors. This period, which shows the largest variation from the world portfolio, comprised the months leading up to and including the September 1995 landmark Law on Foreign Investment, in which Castro instituted changes in policy, law, and rhetoric. This was the time in Cuba’s special period of transformation when the government was experimenting with market openings, an event heavily covered in the international press. In contrast, no significant external policy changes are reported during this period. As such, this period could be the exception to the rule that external events have less impact on Cuban economic performance than domestic ones. However, it is important to note that these events do not answer our question about the impact of (unilateral) sanctions policy, but rather respond to multilateral events. It appears worthwhile to investigate in another venue the relative impact of unilateral versus multilateral sanctions on the economy of a totalitarian dictator. No significant relevant events external or internal to Cuba appeared in the international press during this period. This deviation from the predicted values for the CUBA portfolio cannot be explained by the methods employed in the events study. This period of under performance occurred as the international press was reporting that the Cuban government was actively pursuing policies of domestic repression. In contrast, no relevant events external to Cuba appeared in the international press during this period. In summary, during the six years following the end of the Soviet subsidy and subsequent pressures on Castro to open his economy to foreign investment, it appears that the policies of the Cuban government, and not those of the United States or other external powers, are responsible for Cuba’s economic successes or failures. Clearly, two factors diminish the importance of U.S. sanctions on the Cuban economy. First, Castro himself limits the amount of foreign direct investment based upon his selection of internal policies in Cuba—his political choices as absolute ruler. Second, the sanctions are unilateral—the rest of the world can trade with Cuba. If the United States cannot influence the flow of FDI from other countries (Canada, Mexico, and Europe were the largest investors in Cuba in the 1990s), the reasons these countries reduced their rate of investment in the late 1990s must lie elsewhere—beyond the continuing U.S. sanctions. Indeed, the data shows that the Helms-Burton law did not significantly impact foreign investment performance in the Cuba portfolio until the European Union agreed on implementation measures with the United States. It appears that Castro himself is responsible for the poor economic performance of his economy. He has the entire world except the United States to trade with now. He had the opportunity to open the economy to a much higher level of foreign investment but made policy decisions that limit further investment. Without the U.S. embargo, would Castro let the Cuban economy flourish? A public choice economic model of the impact of sanctions on a totalitarian dictator suggests he would not (see Appendix). Castro’s rule reflects each of these characteristics. He has totally controlled the Cuban government since shortly after coming to power in January 1959. He controls government policy over wages and working standards, tax rates, monetary policy, government spending, and foreign investment. He controls the police and the all-powerful Committees for the Defense of the Revolution (CDR)—the neighborhood watch network that prevents ordinary Cubans from communicating freely or organizing within their communities.16 Nor does Castro have the Cuban people’s consent to rule. Shortly after seizing power in 1959, however, he rejected elections; on May 16, 1961, he declared Cuba a Socialist country, and he has ruled Cuba ever since. It is plausible to assume that Castro wants to maximize his power for the reasons described above. In particular, given his lack of legitimacy, he needs to maintain his military and security forces, needs to maintain the appearances of strength and power, and needs to keep society’s elites convinced that any attempt at overthrow is futile. To do all this he must continue to monopolize the nation’s sources of wealth. If Castro seeks simply to maximize his revenues, the Cuban government would provide the profit-maximizing marginal tax rate and level of government spending. However, a vital element in the budget constraints of a totalitarian dictator is the cost of maintaining his power, such as the CDR and military police. In addition, stability and wealth are not necessarily complementary goals for the dictator. In fact, wealth above a theoretical level can promote instability and below a theoretical level promote stability. Thus, Castro’s legitimacy and his survival in office both depend upon his successful management of the national budget to maximize his revenues while minimizing his security costs—which will tend to rise as the middle class grows and civil society develops. He will provide a regular system of taxation and ensure his monopolization of this power, and he will provide for public services to enhance the productive capacities of his economy. He will accept foreign direct investment to the extent that he can control it, and he will accept unlimited amounts of direct investment through the government. The expectations of the model suggest that the dictator does not want unlimited economic growth in Cuba. The unifying element of his behavior is control: the totalitarian dictator will seek to monopolize all sources of wealth. 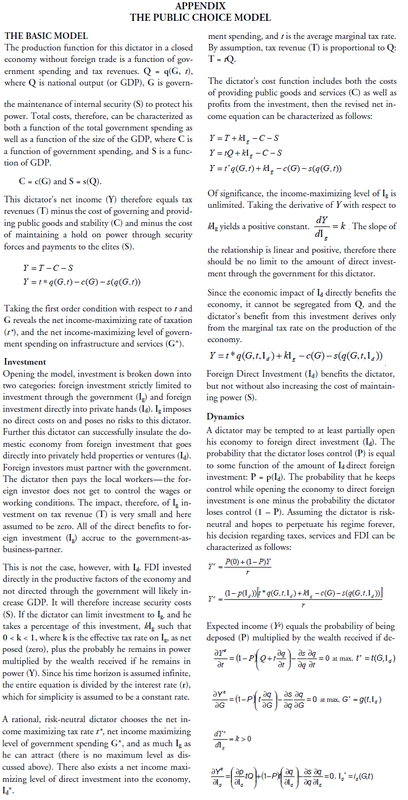 It became apparent from the model that he needs economic control because the diffusion of economic wealth increases his costs of maintaining political power. Regardless of his rhetoric in Congressional debates in Washington, DC, Castro in fact prohibits the flow of private investment into Cuba through rigid policies detrimental to foreign investment. Castro chooses the poverty in Cuba, because this suffering of the Cuban people corresponds to his optimum level of economic performance given the constraints modeled above. In the end, one may conclude that sanctions amount to symbolism—a condemnation by one country of another. Many argue that public condemnation by the United States has meaning in the world in 2002. U.S. Presidents and the Congress may choose sanctions exactly because they are symbolic. Significant in this analysis is the point that the sanctions do not harm the innocents, and so the moral cost associated with the “purchase” of these sanctions may be acceptable to the policy maker. That policy maker, however, may also reject unilateral sanctions as a tool because of the inability to also inflict any economic harm on the dictator. Regardless of the decision within the United States, the debates regarding these policies should be based upon a realistic understanding of the extent to which sanctions actually produce economic results in Cuba. If U.S. import and export embargoes do not affect Cuba’s economic performance, then U.S. sanctions neither harm the Cuban people nor prevent the strengthening of Castro’s security forces. In this case, policy analysts might ask two questions: what does the United States gain and lose from its sanctions, and why do the Cuban people suffer in poverty? The answer to the first question is for another day and another forum. This study, however, seeks to set out the framework for a new, hopefully cogent policy debate. The debate over “who the United States is harming, the dictator or the people” must end. It is time to address the causes of poverty and the constraints placed upon a totalitarian dictator by the circumstances of his power. 1. This paper received valuable input from Mark Crain, Roger Congleton, Vivien Ravdin, Jorge Pérez-López, and many others too numerous to list. All errors are my own. 2. Subsidies averaged $4.3 billion per year from 1986-1990, or 15% of Cuba’s GDP at official exchange rates. This number would be much higher if converted at market exchange rates (Hernández-Catá, 2000). 3. Kimmerling, Stephen J. 2000. 5. Note that private property is outlawed in Cuba, although individuals may operate self-employment businesses such as government licensed restaurants from private homes (paladares). Until the mid-1990s it was illegal for anyone other than the government to own real property, including a home or a business. All foreign investors, therefore, were forced to partner with the Cuban government through joint ventures, production agreements, and joint accounts. This law changed during in September 1995 (Decree Law 77) with the intent to increase foreign investment. In practice, however, there has been no change in the implementation of ownership rights under Cuban law. The Cuban government in effect is still the partner in all significant foreign investments in Cuba (Pérez-López 1996). 6. Because the Cuban government controls employment, salaries, benefits, and other personnel decisions, the foreign investor’s ability to improve the workers’ wealth and quality of life is limited by the government’s willingness to accept such improvements. This is not the case in some other dictatorships. For example, an investment in the People’s Republic of China in 2000 could have dramatically impacted the lives of workers as Western companies set wages, working and safety conditions, and even provided housing and medical care. In Cuba, however, no such power exists for the foreign investor. The government, in fact, controls the flow of income and assets to the Cuban people. 7. For detailed examples of the problems with Cuban government data see Werlau 1998 and Pérez-López 2000. Xt-1= the t-1 by k matrix of the World variable. The residual from the recursive model, wt, is independent and normally distributed with mean equal to zero and variance equal to ó2. 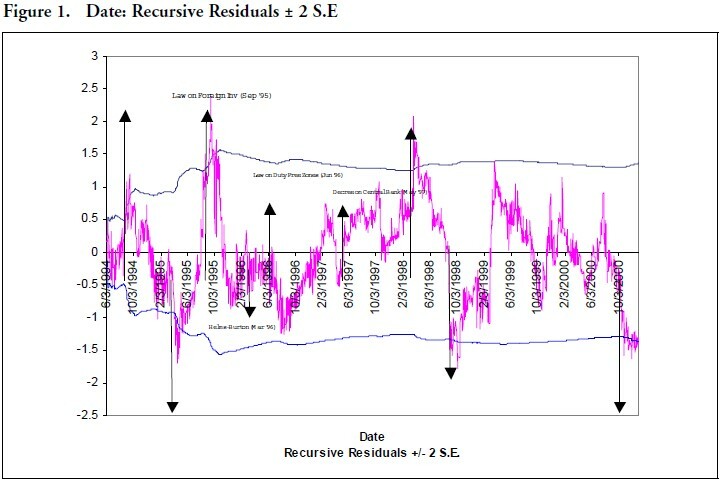 The residuals thus reflect random “shocks,” or unanticipated deviations from the time series pattern. The analysis focuses on the significant variations when the World portfolio fails to predict the CUBA portfolio to within two standard deviations. This recursive residual is measured on the vertical axis in Figure 1. In addition, lines representing two standard errors from the residual are also plotted. Points falling outside of two standard errors indicate a time of instability when the World portfolio failed to predict the Cuba portfolio. Moving forward in time, the outlying values will be incorporated into the model for the next least squares prediction, so the mean would again be expected to go to zero. 10. This criterion comes from the literature on recursive regression (Green 2000) and the E Views software package and users guide. 11. P.L. 104-114 of March 12, 1996. 12. The lack of significant impact of the Helm-Burton law may be attributable to market expectations. If the market expected the eventual passage of this law, then the daily stock prices would have already incorporated this law. However, this bill had been introduced in Congress with no action for a considerable amount of time with no action and clear opposition. It passed immediately following Castro’s shoot-down of the Brothers to the Rescue aircraft in the Florida straits. Therefore, this act’s final passage into law was a surprise to many of the Members of Congress who had advocated its passage for the previous year, so it is reasonable to assume that it was a surprise to the market. 13. We know that some of the most democratic and egalitarian constitutions in the world are and were those of the People’s Republic of China and the Soviet Union. The implementation of these documents, however, was far from rigorous and the world understood the governments based upon their deeds. 14. For a detailed discussion of this agreement see Roy 2000. 15. See “The Iron Fist and the Invisible Hand: A Case Study in the Economics of Totalitarianism,” by Gary Shiffman, unpublished dissertation. 16. The CDRs were formed on September 28, 1960, inaugurated by Castro in a speech given at the Plaza of the Revolution. 17. To a Chicago Tribune reporter, Havana, March 2001.